John Golland was born in Ashton-under-Lyne on Sep 14 1942, to John Edward Golland (b.1912) and Anne (nee Whitley, b.1912). Both parents had worked in the cotton industry, his father later becoming a window-cleaner and his mother working as a dressmaker. John was an only child, who after a difficult birth suffered problems with his sight until the age of 26, and with other physical disabilities. At the age of 2 he was found playing nursery rhymes on his maternal grandmother's piano, and his parents bought their own piano when John was aged 4, learning with Peggy Mayers outside school. He was educated at St Mary's Catholic Primary School, Dukinfield, moving to de la Salle College, Salford, on a scholarship aged 11. At de la Salle he was taught piano by the school music-master and began to learn the violin and recorder; he also began to compose and to arrange hymns for the annual speech days. In 1960 he attended teacher training college in Oldham (also de la Salle), beginning his first job as a music teacher at St Anselm's School, Oldham in 1964. He also studied part-time at the Royal Manchester College of Music, with Thomas Pitfield (for composition) and Marjorie Clemans (for piano). In his 20s Golland joined the Stalybridge Band, learning the euphonium; thereafter he regularly wrote and arranged for both brass band and wind band. He conducted the Boarshurst Band, and was later the Music Master of the West Hill Band and Choir (Mossley Brow). In 1970 he became musical director of the Adamson Military Band, and turned from full time school-teaching to composition. He later also directed the City of Chester Band, Fodens, James Shepherd Versatile Brass, Dobcross Band, and the W. Harrison Transport Rockingham Band. He also conducted frequently in Switzerland from 1975 onwards, and many of his works were written for bands there. Initially Golland taught in schools full time, but from 1970 concentrated on composition and his work with brass bands. His best known band works include Sounds, Atmospheres, Fives and Threes, Rêves d'Enfant, and Concertos for euphonium (2) and flugelhorn. In addition he wrote and arranged incidental music for television (Dear Ladies), and for young people including a children's opera The Selfish Giant. Compositions for other instuments include recorder, orchestra (including 3 Sinfoniettas), and wind quintet. He made over 150 arrangements, ranging from hymn tunes to popular classics. He also wrote regularly for the British Mouthpiece about various aspects of the band. In the late 1980s he resumed teaching, in the department of Media Studies at Salford College of Technology. Golland died April 14th 1993, after a long illness. Deposited by Mrs Golland in 1998; given by her executors in 2001. A number of works were returned from the publisher in 2004. Owned by The Golland Trust. The Golland Papers chiefly comprise the original compositions (in MS) of John Golland, and his arrangements of the works of other composers. 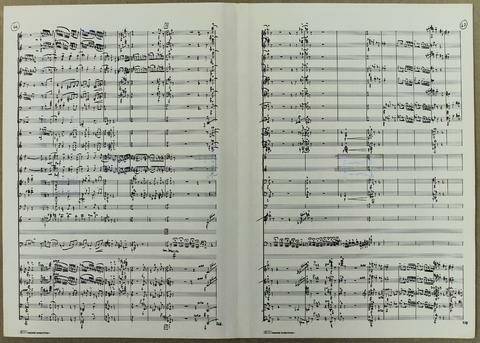 There are also papers relating to his teaching work at Salford Polytechnic, his work as editorial assistant on the Bandkraft series, and in his library of works, of his conducting of a number of bands and other ensembles. Duplicate, unmarked photocopies of original works and arrangements, and corrected proofs and duplicate photocopies of blank proofs for the "Bandkraft" series (published by Forsyth Brothers) were destroyed as being of no continuing value. Golland's library of parts of works by other composers were transferred to the RNCM Library or returned to the Golland Trust; a list is available. No further material is expected, although missing items may appear in the future. Golland kept his own works in two series, original compositions and arrangements; he also kept a series of works by other composers. Accordingly the Papers have been arranged into 6 series: A- Arrangements O - Original compositions S - sketches T - teaching notes X - Bandkraft Y - Library.